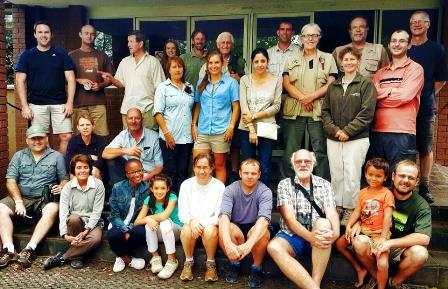 The ADU held a Pilot Citizen Science Event at the Hans Hoheisen Wildlife Research Station (adjacent to Orpen gate, Kruger National Park). The accommodation was filled with about 30 people. We held bird ringing sessions, bird atlasing and took photos for the Virtual Museum. No weavers were breeding at the site, although old Red-billed Buffalo-Weaver and Spectacled Weaver nests were found. Three weavers passing through were ringed - a Southern Masked Weaver, Red-headed Weaver, and Spectacled Weaver. At the nearby SA Wildlife College there were old Red-headed Weaver nests, and several active Red-billed Buffalo-Weaver colonies. A wide range of talks were presented at the Research Station on Saturday and Sunday, and the ADU also presented talks for some of the students at the SA Wildlife College on Friday. VM records from HH, past and recent records shown.